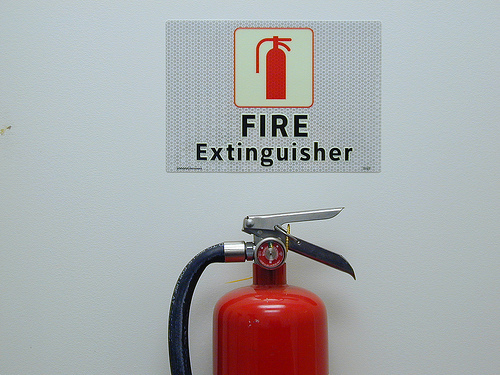 Home Costs > How Much Does Recharging a Fire Extinguisher Cost? How Much Does Recharging a Fire Extinguisher Cost? Recharging a fire extinguisher is a process that replaces the chemical agent that is expelled from the unit, and this service is generally done inside commercial buildings that have larger extinguishers which use a dry chemical substance. The cost of recharging a fire extinguisher will depend on the extinguisher, the number needed to be recharged and the professional recharging. For example, the fire station in Fridley, Minnesota, allows residents to drop their fire extinguishers off for a recharge, and their fees range anywhere from $9 to $19 depending on the size of the extinguisher. Another company we researched in Reno, Nevada, charged $15 for each charge and another $2.35 per pound for the chemicals. During a recharge, the service will completely refill the extinguisher with a new agent, and this process should not take longer than 10 to 20 minutes. It can commonly be done at local fire stations or via a private company. Most of the time, the recharging will be handled by a specialty company that has a partnership with the extinguisher’s manufacturer. Keep in mind that single charge fire extinguishers cannot be recharged. To know if your fire extinguisher can be recharged, check for a metal gauge on the top. If it’s made of plastic, then it’s best to dispose of it and purchase a newer one. If you need the extinguisher tested during the recharge, add another $5 to $10 to the price estimates in the table. If the extinguisher is too old or cannot be recharged, a new one can cost anywhere from $12 to $50 for a simple household version. Every six to eight years, it is highly recommended that maintenance is done to ensure that the fire extinguisher is up to code. These visits maintenance runs can cost anywhere from $30 to $50. It may be more cost efficient to purchase a new extinguisher if the one you have is for household usage. By the time the recharge has been done, the newer one could be the same price, if not cheaper. Also, it may not be recommended. For example, on Stack Exchange, a former repair tech chimed in and said while some extinguishers can be recharged, you may want to avoid doing so because it could crack the plastic/nylon heads, leading to potential leaks. Some fire extinguishers can be refilled if the valve enables you to refill it. Remember that if you ever have questions, it’s always best to talk to the local fire station to ensure that you’re taking the right steps. RIPP OFF!! Local FD’s should refill home units for FREE. Heck WE PAY THEIR BILLS WITH TAXES!! !